Karl Richard Lepsius (December 23, 1810 – July 10, 1884) was a German archaeologist and linguist, one of the founders of the modern scientific discipline of Egyptology. He led several expeditions to Egypt and the Sudan, during which travels he studied the Pyramids of Giza, the Valley of the Kings, and other important sites along the Nile River. He published his results with plates of ancient Egyptian inscriptions, maps, drawings, and descriptions and commentaries on the sites. In several cases, these remain as the sole record of items that were later destroyed. Lepsius was also involved in the translation of hieroglyphs, building on Jean-François Champollion's work in deciphering the Rosetta Stone. His discovery of the Canopus Decree in Tanis, with similar inscriptions, further substantiated these efforts. Also serving as professor and curator of the museum at the University of Berlin, Lepsius made a substantial contribution to our knowledge of the significant civilization of ancient Egypt which so greatly influenced providential history. 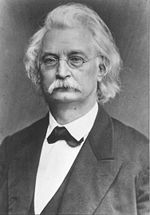 Karl Richard Lepsius was born on December 23, 1818 in Naumburg, Saxony (now in Germany), the third son of Karl Peter Lepsius and Friedericke Glaser. He studied Greek and Roman archaeology at the universities of Leipzig (1829-1830), Göttingen (1830-1832), and Berlin (1832-1833). After receiving his doctorate following his dissertation De tabulis Eugubinis in 1833, he traveled to Paris where attended lectures by the French classicist Jean Letronne, an early disciple of Jean-François Champollion and his work on the decipherment of the Egyptian language. Lepsius also visited Egyptian collections all over Europe and studied lithography and engraving. After the death of Champollion, Lepsius made a systematic study of his Grammaire égyptienne, which had been published posthumously in 1836, but was yet to be widely accepted. In 1836, Lepsius traveled to Tuscany to meet with Ippolito Rosellini, who had led a joint expedition to Egypt with Champollion in 1828-1829. In a series of letters to Rosellini, Lepsius expanded on Champollion's explanation of the use of alphabetic signs in hieroglyphic writing, emphasizing (unlike Champollion) that vowels were not written. In 1842, Lepsius was commissioned (at the recommendation of Alexander von Humboldt and Carl Josias Bunsen) by King Frederich Wilhelm IV of Prussia to lead an expedition to Egypt and Sudan to explore and record the remains of the ancient Egyptian civilization. The Prussian expedition was modeled after the earlier Napoléonic mission, and consisted of surveyors, draftsmen, and other specialists. The mission reached Giza in November 1842 and spent six months making some of the first scientific studies of the pyramids of Giza, Abusir, Saqqara, and Dahshur. They discovered over 67 pyramids and more than 130 tombs of noblemen in the area. While at the Great Pyramid of Giza, Lepsius inscribed a graffito written in Egyptian hieroglyphs that honors Friedrich Wilhelm IV above the pyramid's original entrance; it is still visible. Working south, Lepsius stopping for extended periods at important Middle Egyptian sites, such as Beni Hasan and Deir el-Bersha, Lepsius reached as far south as Khartoum, and then traveling up the Nile to the region of Sennar. After exploring various sites in Upper and Lower Nubia, the expedition worked back north, reaching Thebes on November 2, 1844, where they spent four months studying the western bank of the Nile (such as the Ramesseum, Medinet Habu, the Valley of the Kings) and another three on the east bank at the temples of Karnak and Luxor, attempting to record as much as possible. Afterwards, they stopped at Coptos, in the Sinai Peninsula, and sites in the Nile Delta, such as Tanis, before returning to Europe in 1846. The chief result of this expedition was the publication of the Denkmäler aus Aegypten und Aethiopien (Monuments from Egypt and Ethiopia), a massive 12-volume compilation of nearly 900 plates of ancient Egyptian inscriptions, as well as accompanying commentary and descriptions. These plans, maps, and drawings of temple and tomb walls remained the chief source of information for Western scholars well into the twentieth century. They are useful even today as they are often the sole record of monuments that have since been destroyed or reburied. Upon his return to Europe in 1845, Lepsius married Elisabeth Klein in 1846 and was appointed as a professor of Egyptology at Berlin University in the same year, and the co-director of the Ägyptisches Museum in 1855. After the death of Giuseppe Passalacqua in 1865, he became the sole director of the museum. In 1866, Lepsius returned to Egypt, where he discovered the Canopus Decree in Tanis, Egypt, an inscription closely related to the Rosetta Stone, which was likewise written in Egyptian, Demotic, and Greek. Lepsius was president of the German Archaeological Institute in Rome from 1867 to 1880, and from 1873 until his death in 1884 he was the head of the Royal Library in Berlin. Lepsius died on July 10, 1884 in Berlin, Germany. Lepsius published widely on the culture of Ancient Egypt, and is considered one of the founders of modern scientific discipline of Egyptology. Much of his work is fundamental to the field. Lepsius even coined the phrase Totenbuch ("Book of the Dead"). He was also a leader in the field of African linguistics, though his ideas are now mainly considered to be outdated. Based on his work in the ancient Egyptian language, and his field work in the Sudan, Lepsius developed a Standard Alphabet for transliterating African languages, which was published in 1855 and revised in 1863. Lepsius was the editor of the Zeitschrift für ägyptisches Sprache und Altertumskunde, a fundamental scientific journal for the new field of Egyptology, which remains in print to this day. While at the editorial helm, Lepsius commissioned typographer Ferdinand Theinhardt (on behalf of the Königlich-Preußischen Akademie der Wissenschaften zu Berlin) to cut the first hieroglyphic typeface, the so-called "Theinhardt font," which remains in use today. Lepsius, Karl R. 1842. Das Todtenbuch der Ägypten nach dem hieroglyphischen Papyrus in Turin mit einem Vorworte zum ersten Male Herausgegeben. Leipzig: G. Wigand. Lepsius, Karl R. 1849. Denkmaeler aus Aegypten und Aethiopien nach den Zeichnungen der von Seiner Majestät dem Koenige von Preussen, Friedrich Wilhelm IV., nach diesen Ländern gesendeten, und in den Jahren 1842–1845 ausgeführten wissenschaftlichen Expedition auf Befehl Seiner Majestät. 13 vols. Berlin: Nicolaische Buchhandlung. Lepsius, Karl R. 1880. Nubische Grammatik mit einer Einleitung über die Völker und Sprachen Afrika's. Berlin: Verlag von Wilhelm Hertz. ↑ The Hieroglyphic Inscription above the Great Pyramid Entrance Catchpenny Mysteries, 2002. Retrieved December 10, 2007. Karl (Carl) Richard Lepsius: A Founder of Modern Egyptology – Biography by Jimmy Dunn. Lepsius Archiv - Archival material from Lepsius' 1842-1845 expedition to Egypt and Nubia. History of "Karl Richard Lepsius"
This page was last modified on 13 April 2018, at 14:18.